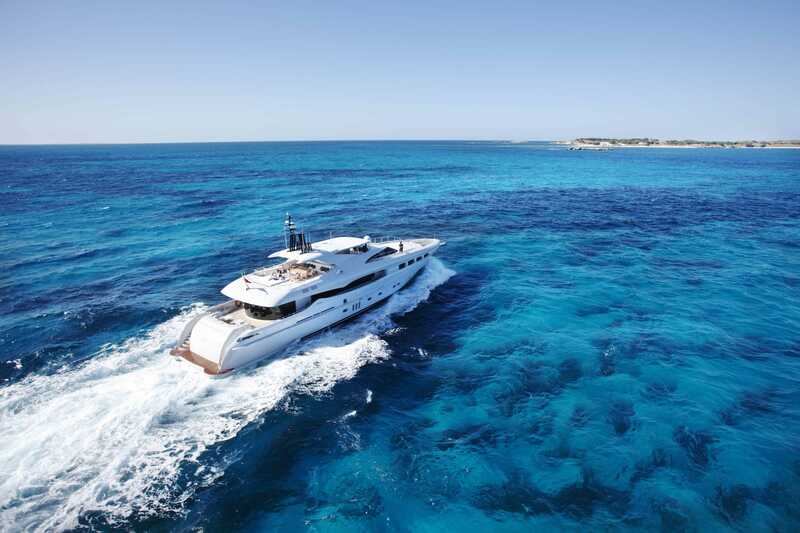 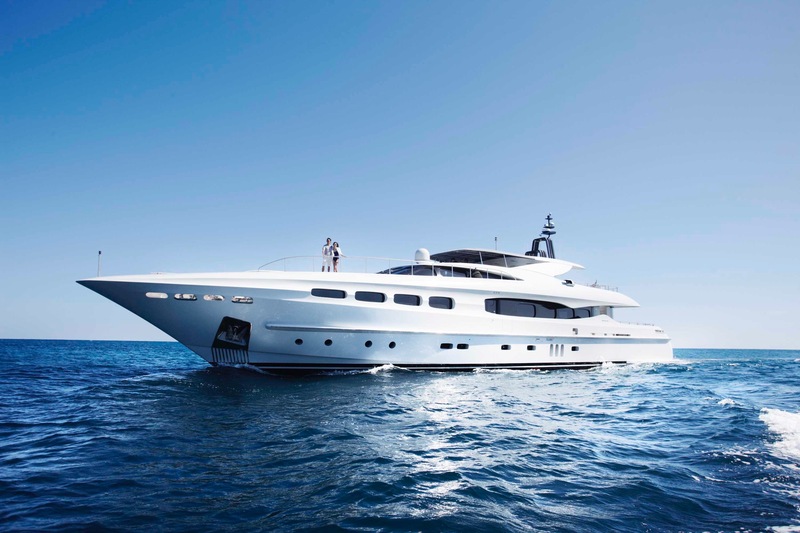 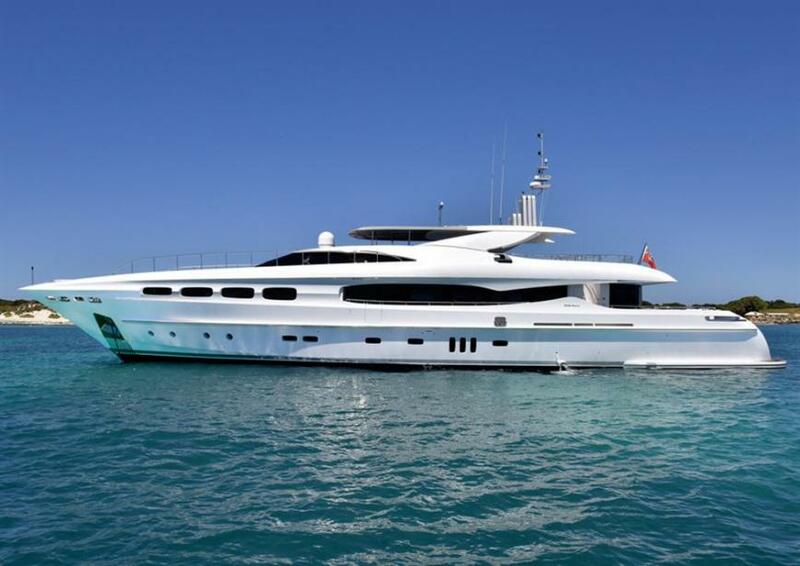 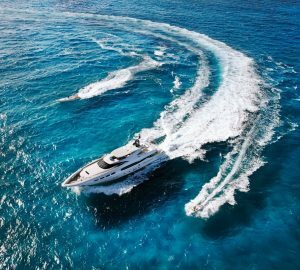 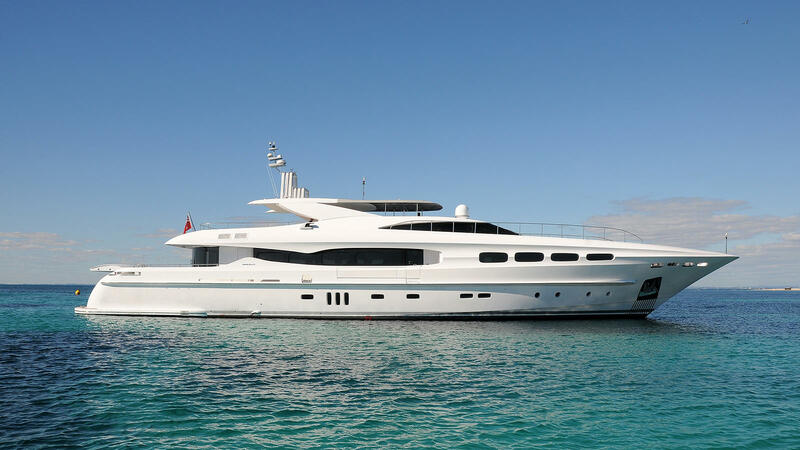 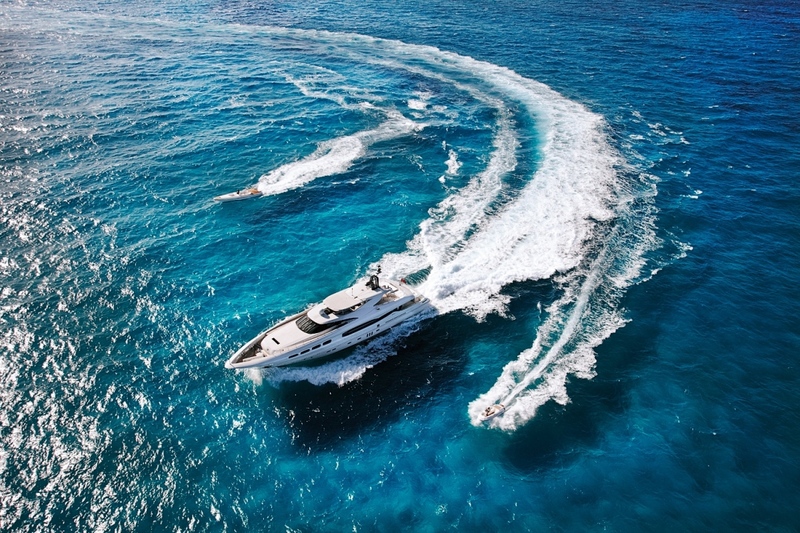 Luxury motor yacht INFINITY PACIFIC (ex Infinity, Streamline) was delivered in 2007 by Mondomarine, she measures 40,02m (131,11ft) and accommodates up to 10 charter guests, in 5 spacious cabins. The stylish yacht's interiors are by Luca Dini & Frederic Mechiche, while her sleek exterior is the work of naval architect Cor D. Rover Design. 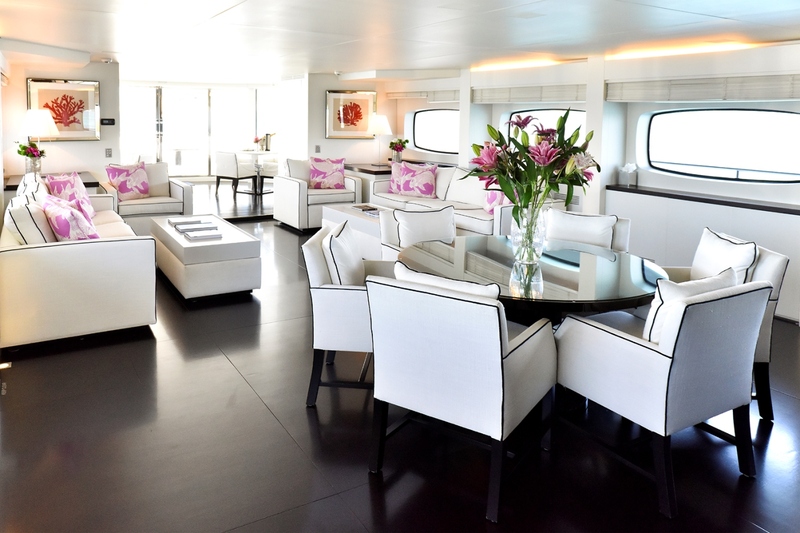 The interior living is well appointed and spacious laid over two decks, featuring light toned soft furnishings with detailed piping, creating a tailored ambiance, beautifully complimenting the dark wood floors and white panels. 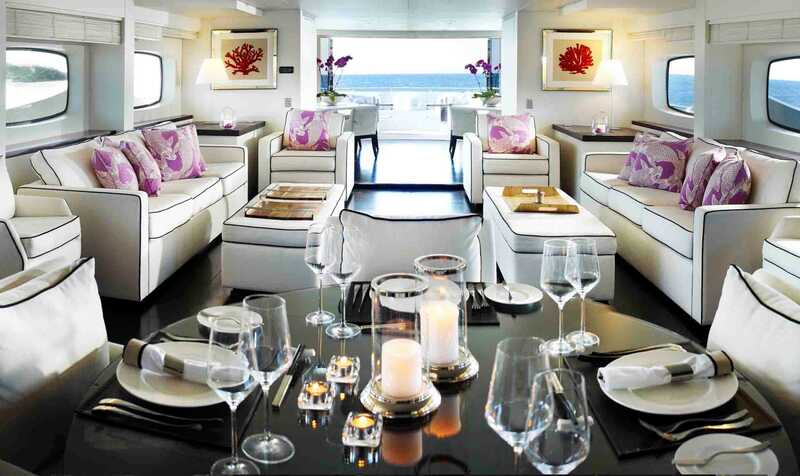 The main salon and dining area is a contemporary open plan, with the lounge area offering two opposing sofas, coffee tables, occasional chairs and dining table. 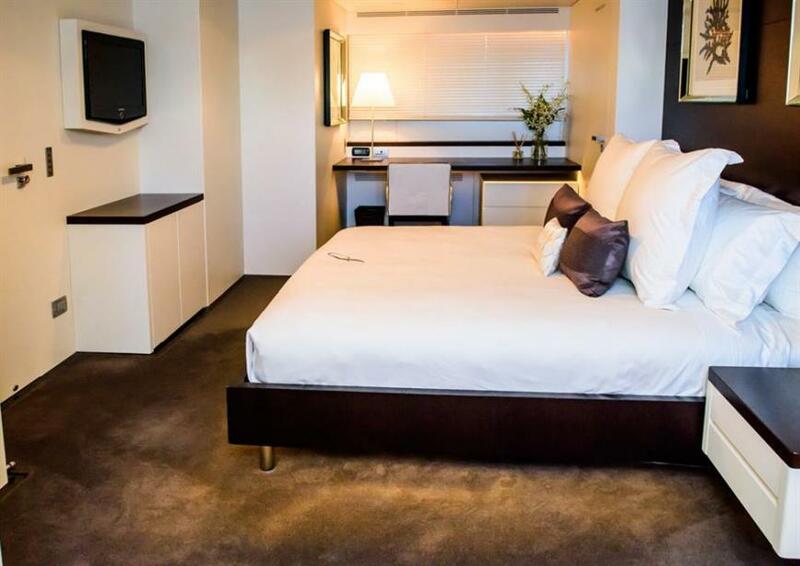 Surrounding windows provide plenty of natural light and good views. 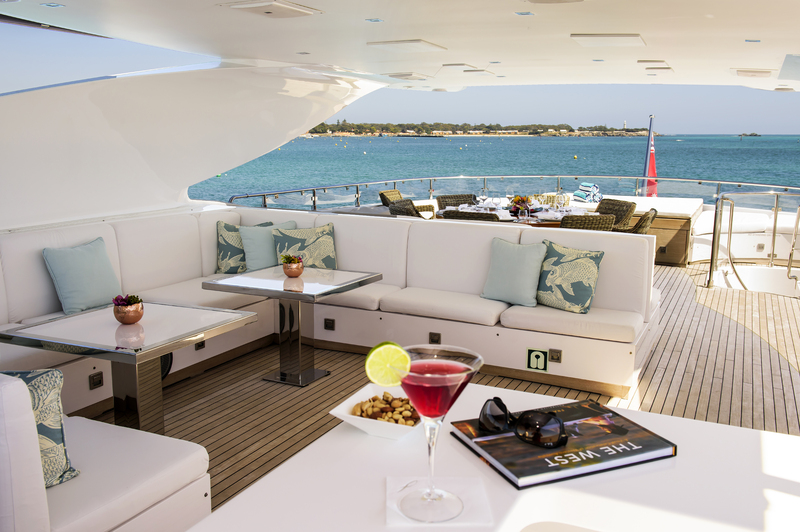 Further aft is a floor to ceiling semicircular glass enclosure, which effortlessly opens to offer optional alfresco dining. 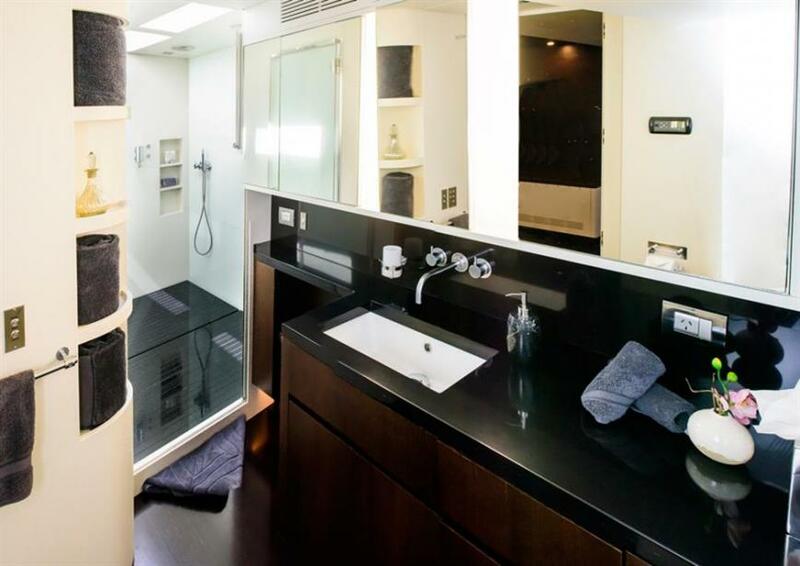 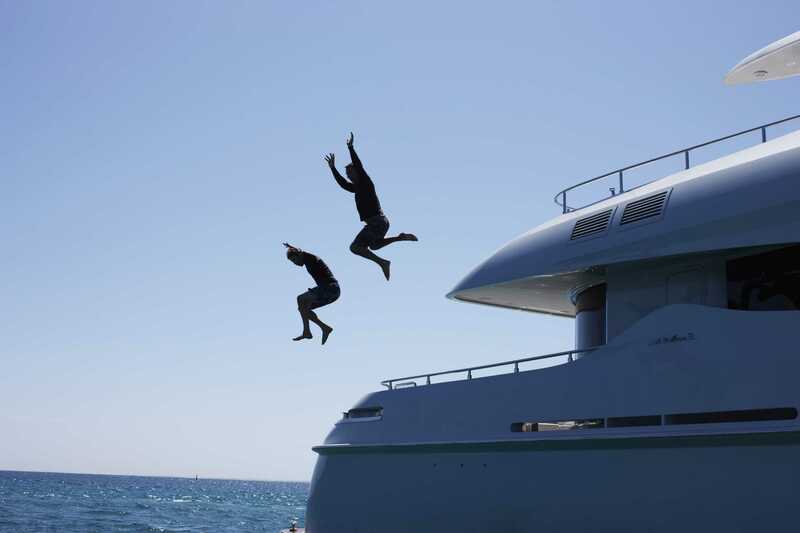 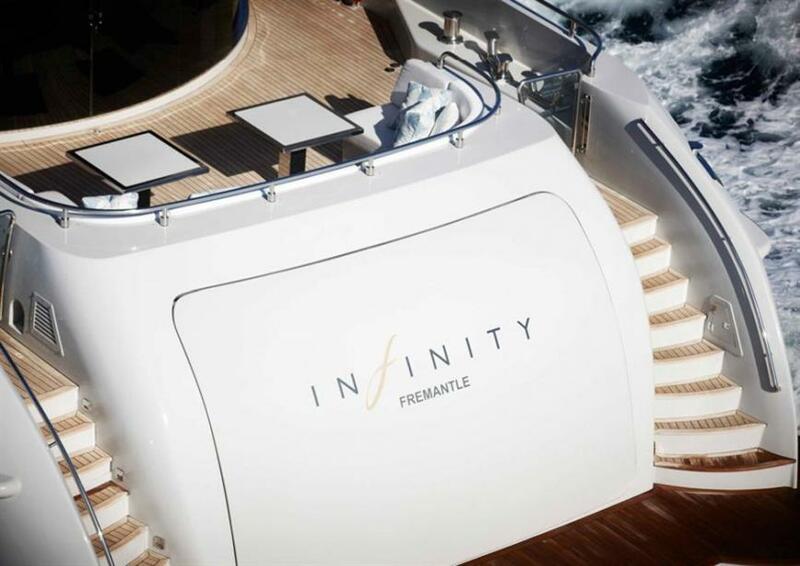 M/Y INFINITY PACIFIC has ample exterior areas to enjoy, relax and socialize. 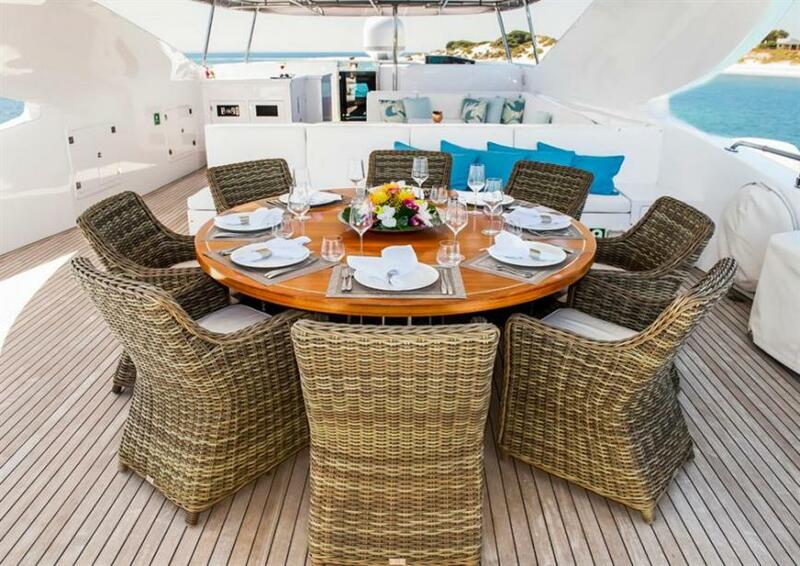 The aft deck is easily accessed from the salon and has a generous seating area and alfresco dining. 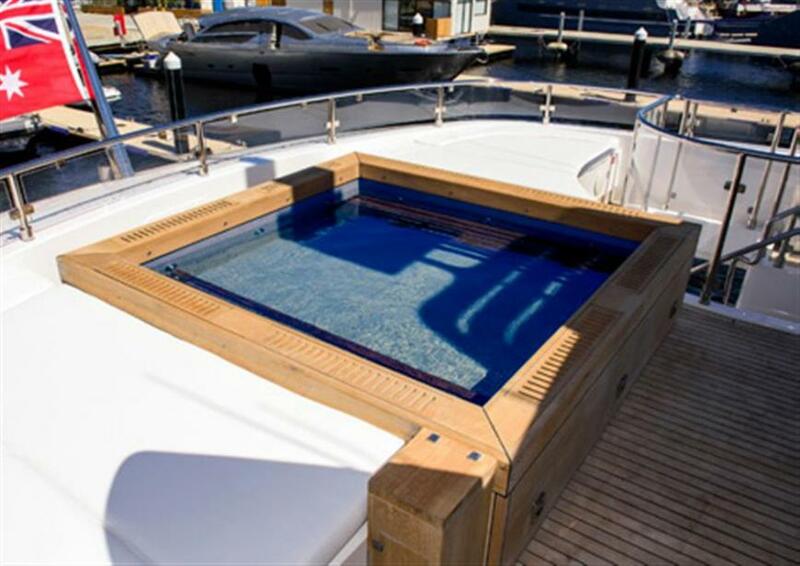 From here steps on both sides of the yacht lead down to the extended swim platform, where guests can make the most of the water toys on offer. 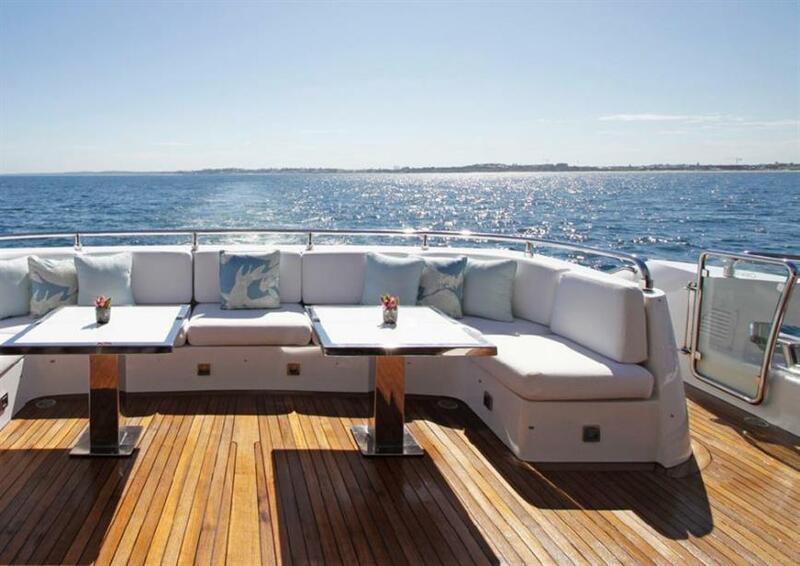 The sundeck is exceptionally spacious and ideal for any occasion. 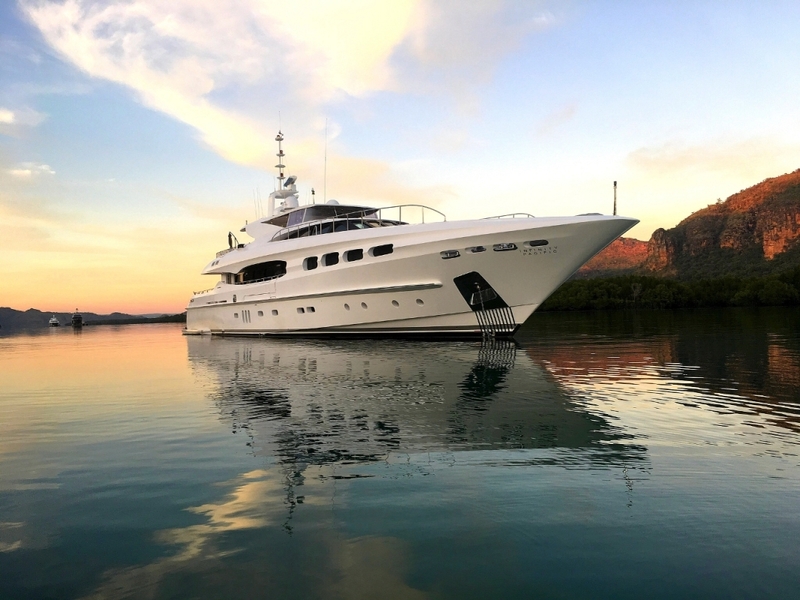 It boasts a spaded section with comfortable seating and cocktail tables, followed by an alfresco dining table centered, while aft hosts sun pads and a deluxe Jacuzzi tub. 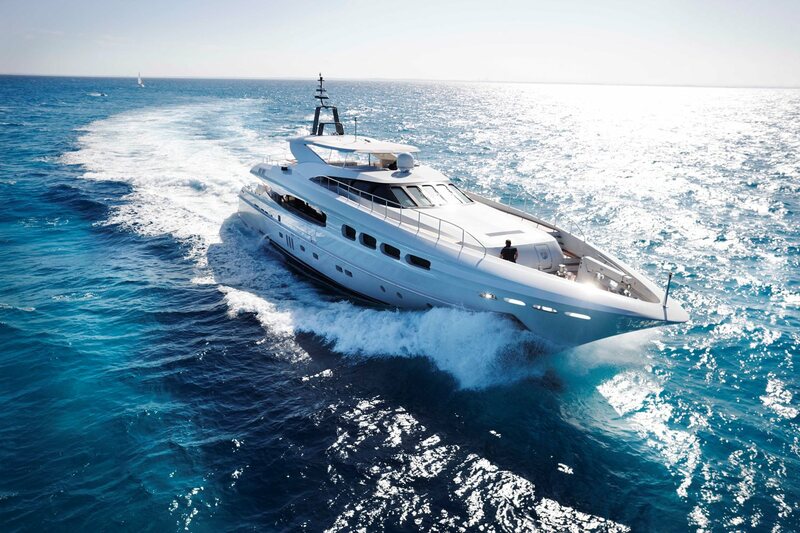 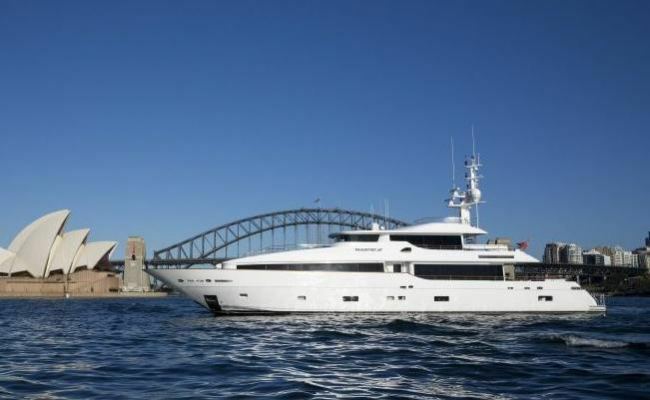 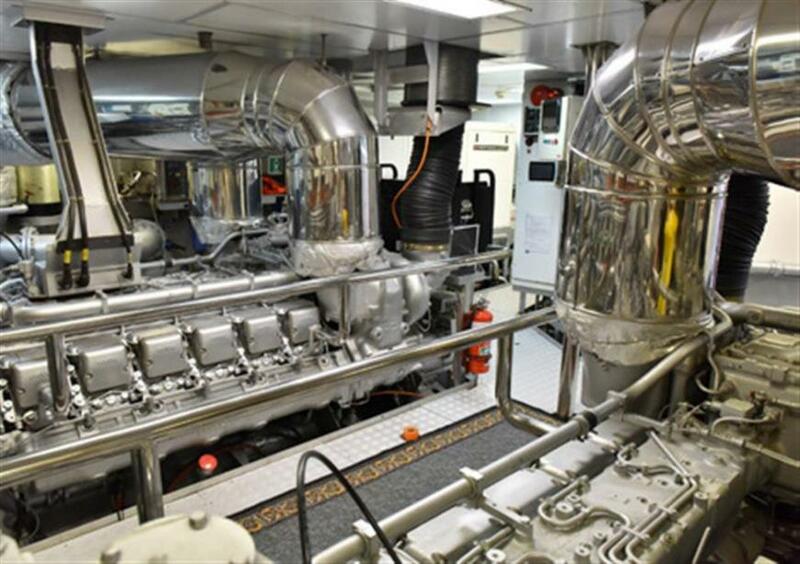 Powered by twin MTU engines, she has cruising speeds of 15 knots and top speeds of 21 knots. 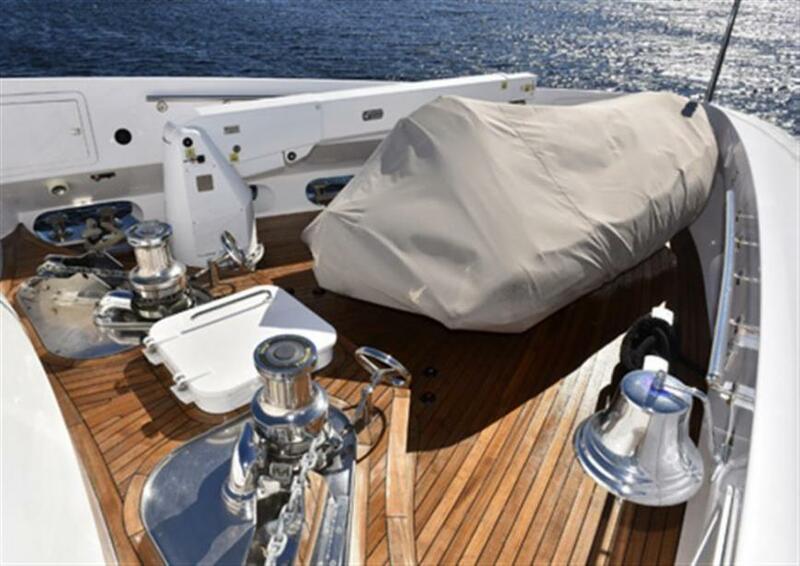 The yacht is fitted with both at anchor and underway stabilizers, ensuring optimum comfort. 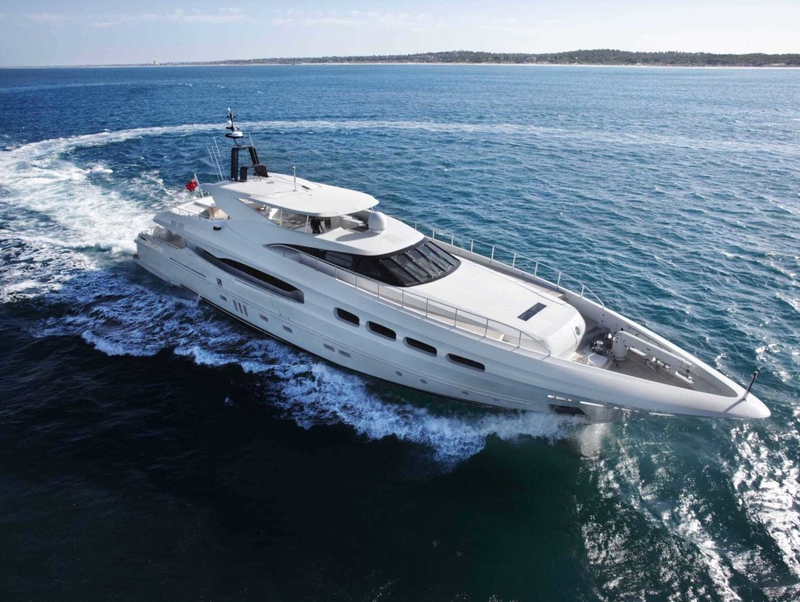 She has a semi-displacement aluminum hull and has a RINA classification. 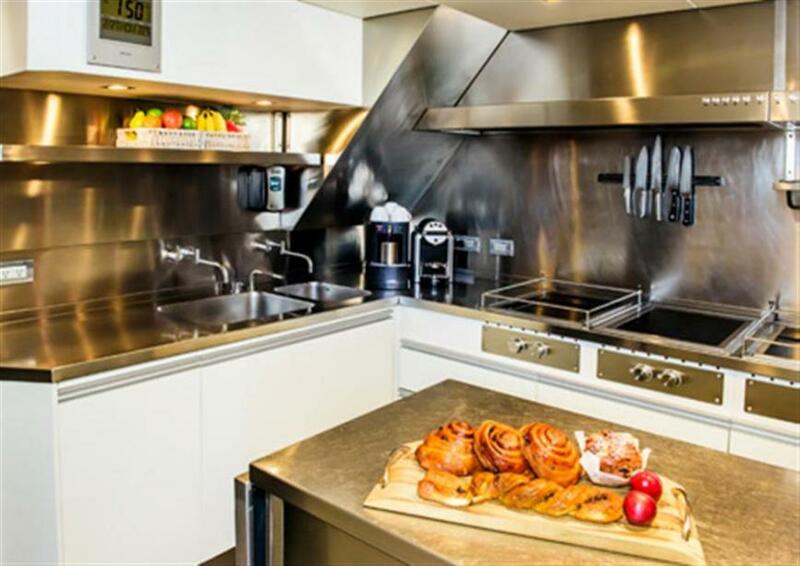 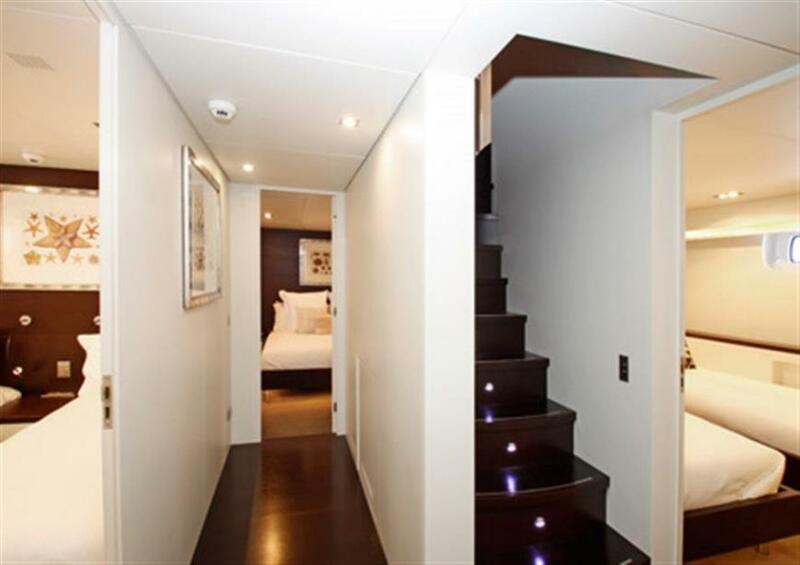 Accommodation is for up to 10 charter guests, in 5 attractive cabins. 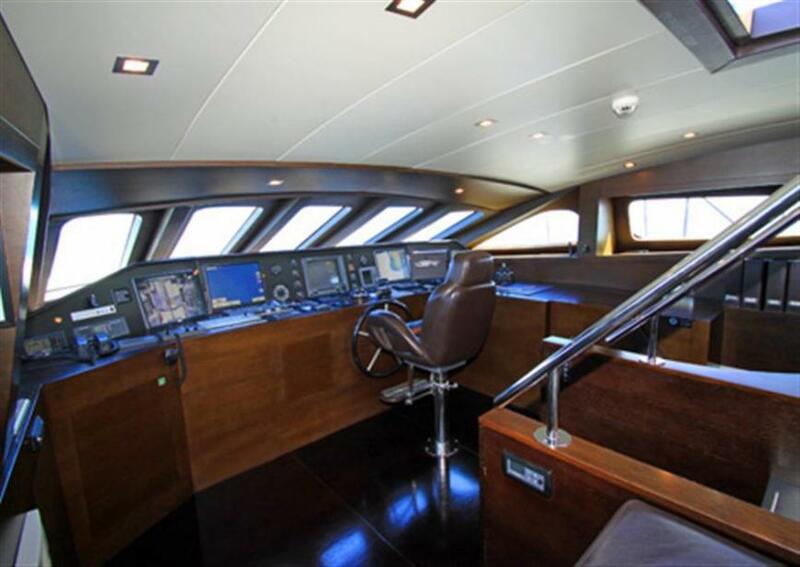 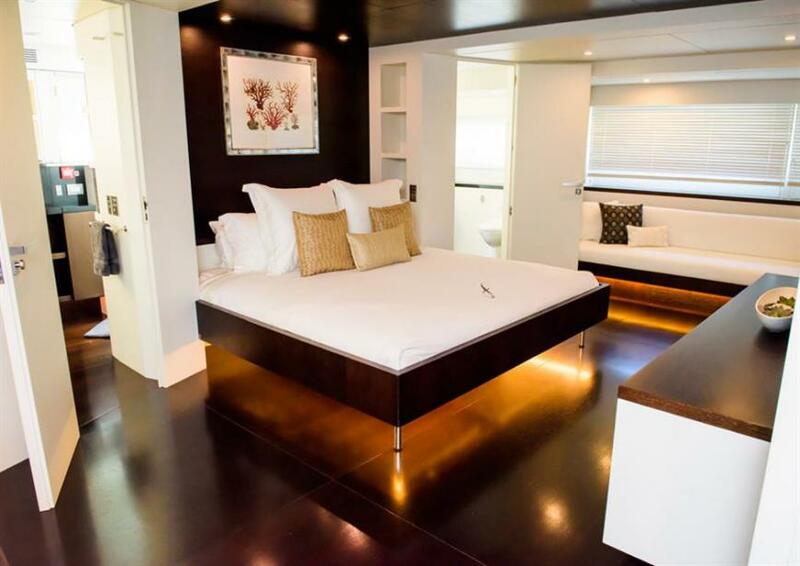 The master stateroom is on the main deck forward and full beam of the yacht. 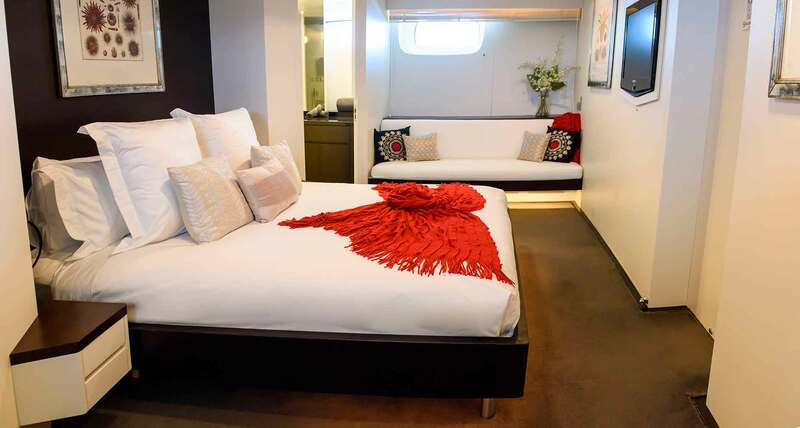 Upon entering the master cabin, there is a private study with seating on the starboard side, this leads into the full beam cabin space where there is a king size bed, sofa, desk, walk-in wardrobe and his and hers ensuite, offering a large central shower. 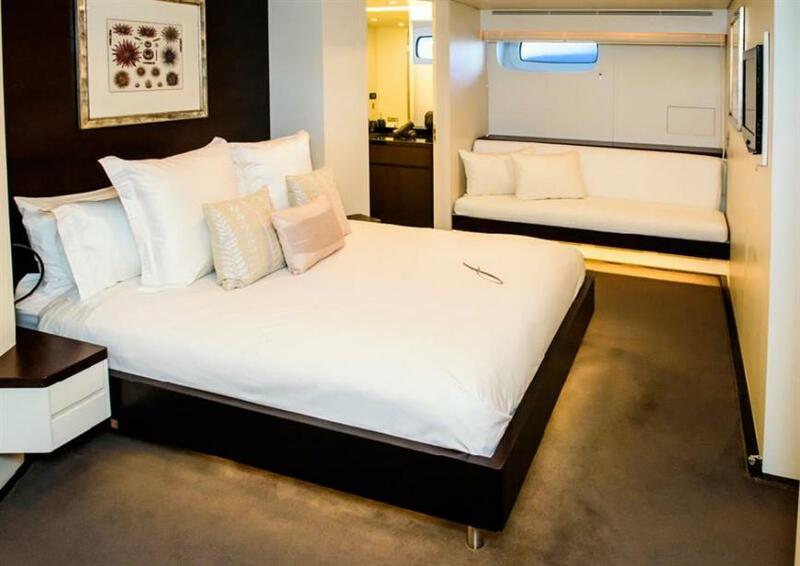 On the lower deck are 2 spacious VIP cabins, each full beam of the yacht, with queen size beds, sofa, desk and walk-in wardrobe. 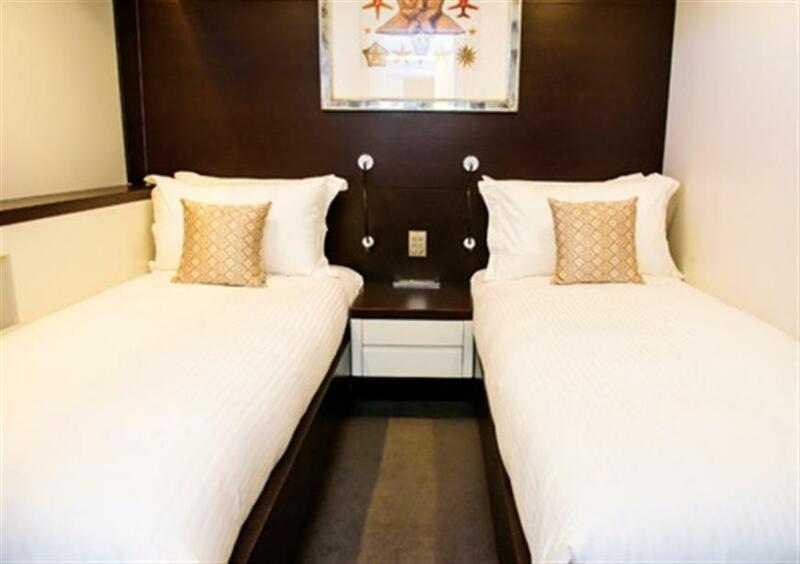 A further 2 cabins are port and starboard, with side by side twin cabins. 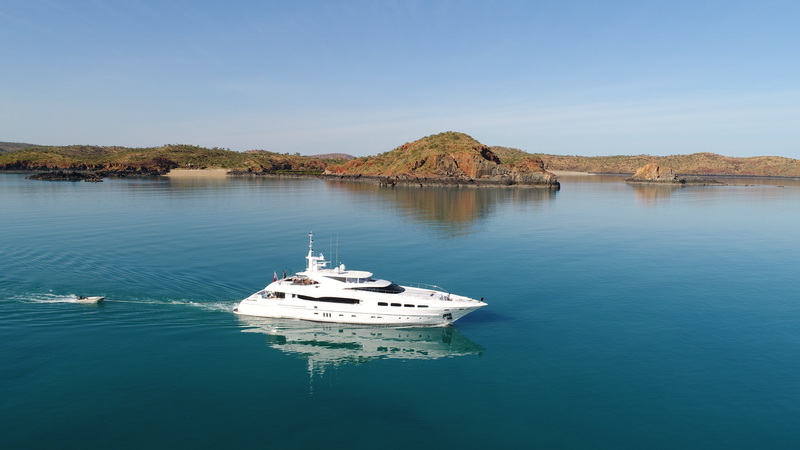 M/Y INFINITY PACIFIC is offering 9 Days for 7 cruising the Whitsunday Islands between June and September, plus no relocation fees for charters in August and September.